Snippets of Rob’s fiction. Often, these are unedited previews of upcoming works. Tonight it’s time for the Docfather, Philip Wohlrab himself. He’s a writer and a combat medic. I’ve had the pleasure of meeting him at LibertyCon and several other conventions. If you’re at a con and see a guy in a heavily-adorned Imperial Andermani Navy uniform, it might just be him. Ultimately, I want to tell a good story, whether it is set in the future, the past, a past that never happened, or complete fantasy. I want to entertain people, pull them out of the land of the mundane, even if for a little bit. Right now, I have a couple of projects that I am working on, first is my novel set in an entirely new universe known as the Squidverse. Think WWII meets Star Wars, with a helping of the Mind Flayers from D&D. I am also writing a short alt history of the Battle of Jutland, where the US and Germany are allies, and lastly another short set in Black Tide Rising, though whether it gets published after certain people read it is going to be interesting. Cyberpunk Electric Blue? Hmmm, I do draw a bit from nature when I am creating new creatures. The Akkorro, aliens in the 4HU, are literally drawn from Cuttlefish. In fact, I like squids, and octopi quite a bit so you will see them featured in my stories in some form or another. I also try to get the little details right, what were the sounds, what were the smells. As a combat vet I can tell you that certain smells will never be forgotten, and I try to bring that out in my writing. Time management is my biggest issue. I should be writing more, but I find myself getting distracted by things. I also tend to idea hop, so I have to make that work for me when I am working on multiple projects. This is a bit of a learning curve. Emotion, I think I do that well. The Beach was an emotional short to write, for me, and I know it has hit readers pretty hard based on some of the feedback I have been given. I like to give people the emotions the characters are feeling, as it allows the readers to connect with the characters. You may have never experienced combat, but you have had some experience that has terrified you, or gotten the adrenaline flowing. So, if I can tap into that, and give the reader some personal idea of what the character is feeling, I am going to try and work that in. Favorite Muppet? Doozers from Fraggle Rock. I mean these guys spend all their time building stuff that the Fraggles just eat anyways. That has to take some fortitude not to poison the Fraggles. Crunchy or Creamy? Creamy for the WIN! Favorite Sports Team? Atlanta Falcons, I am used to disappointment. Cake or Pie? Why not both? Lime or Lemon? Definitely Both. Favorite Musical Performer We’ve Never Heard Of? Gunship, seriously if you like 1980s Cyberpunk go give these guys a listen. Favorite Superhero? Darth Vader. What? He has comic books! Steak Temperature? Damn near still mooing. Best Game Ever? Hmmm I am currently very much enjoying Battletech. Coffee or Tea? Coffee, drank black as hell, or perhaps Irish. Never adulterated with cream or sugar. Rob how do you find time to do all the stuff you do? Rob’s Answer: Uh, I do a bunch of stuff? I don’t feel like it, especially right now when I’ve been fighting a bit of a dry spell with writing. I do try to do at least a little bit each day, though. One of my favorite sections from the Prince Roger series is the bit where Roger talks about eating soup with a knife. It’s not always easy, and it requires determination, but you have to keep doing a bit here and there. I have a couple of things up on Amazon, and a few more on the way. I have a short I independently published entitled The Medic. My short The Beach is available in The Good, the Bad, and The Merc. I have another short that will be published in the Homo Stellaris anthology, that I cowrote with Kacey Ezell, about the first pregnancy in space, and I have a short coming out in the next 4HU anthology involving a German merc company, and the Akkorro. I attend Libertycon and Dragoncon each year and can be found at other Cons in the North Carolina or Virginia area, schedule permitting. 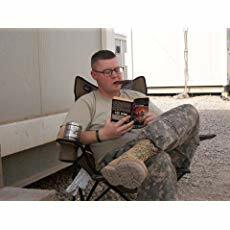 From my Amazon page: Philip Wohlrab has been a medic with the Army for over 12 years, and he has served his time in the sandbox. He currently trains the next generation of Combat Medics and runs a schoolhouse medical section. When he isn’t doing Army things he can be found at various Sci-Fi Cons, and writing. You should have asked how my service has affected my writing. I have served both in the United States Coast Guard, and the Virginia Army National Guard. This has given me a unique look at very different service cultures, and I use that to ensure that when I am writing characters that they are unique to their service branches. Army speak doesn’t always translate well to Naval speak, things of that nature. Lastly a small snippet from my upcoming Squidverse novel. Thanks for doing this Rob! Space itself seemed to blur as ship after ship of the Taiyo battlegroup emerged into the realm of physics that Einstein and Newton would recognize. Atago, a heavy cruiser, formed up the center of the battlegroup alongside the Taiyo, while two Nagara Class light cruisers took up station as the inside defensive ring. Six destroyers formed the outer ring of warships that would protect the heavy cruiser, and light carrier. Admiral Lady Hitomi Izumi scanned her repeaters arrayed around her command dais, she was looking for any flaws in the deployment of her vessels. Admiral Izumi was known to be exacting in her expectations of junior commanders. Finding no faults, she sat back in her command chair and crossed her legs. “Then where are their warships Commander Hasegawa, and why aren’t they here?” growled back Sasaki. Fleet Controller 672 was proud of the fact that she had predicted that the human battlegroup wasn’t going to jump completely out of the system. It was rare that a Squantalavi female would be elevated to a position such as hers, but she had consistently demonstrated that she was one of the most agile thinkers in her cohort of officers. Even in a society dominated by males, 672 had both excelled, and been recognized as one of the best officers of her generation. That didn’t mean that she didn’t experience her fair share of hiccups in her career though. She had not been given a position in of the first assault fleets, but instead had come in as a second-tier commander, as the males of her cohort jealously guarded the prime assignments. Still Fleet Intelligence 11 had seen her potential, and rather than relegating her to one of the Skazi battlecruisers, he had given her command of a Saltze battleship. Thanks to Philip for taking the time to answer my questions and the fun snippet. 2018 is starting off hellishly, in terms of bad things happening. Even worse than last year. I’ve been writing a bunch this week of characters that are based on people I know. Most of that is to help my friend Mar, who had a brain aneurysm on New Year’s Day. This, this is not for that. It’s for someone else. Another fyrd brother who has days to live. Somehow, a large drop of rain slid through the birch leaves, evaded Geirr’s hood, and landed on the tip of his nose. He woke with a start. He stood motionless, ears seeking to hear something besides the next drop striking its target. He was not reassured when he did not hear anything. He went to his sword, noticing that Thyri was already stringing her bow. He pointed at his ear without saying anything. She nodded. “Jussi and Sveinn?” he whispered. They looked at Ansgar, who had awakened and was watching them silently, but not moving or trying to escape. “Cut him free,” he gestured at Ansgar. Suddenly, the darkness was split with a battle cry. Then, just as suddenly, a bright light erupted down the hill. “Ansgar, stay here!” Geirr sprang down the hill, sword in hand and shield at the ready. Thyri followed, cursing the rain, again, but stringing her bow nonetheless. After clearing the trees around the campsite, Geirr could see Jussi holding up a stone that was infused with some magic. The stone glittered, clearly some sort of quartz, and the light came out in rainbow beams. He held his sword in the other hand, but he was not being attacked at that precise moment. Sveinn had charged into the two great creatures, thereby giving Jussi the time to pull out the lightstone. Are those bears? Giant wolves? Geirr stop wondering what those creatures were to race towards the fight. Sveinn chopped at one of the beasts with his favored sword, one that was almost as tall as he. Geirr could see water fly off both the blade and Sveinn’s beard as he twisted all of his sturdy form into the immensely powerful strike. The drops shimmered in Jussi’s light, glinting like diamonds. The beast screamed in pain when the blow landed. But it didn’t fall! How could anything not be slain by that? Geirr stopped wondering as he reached the nearest beast. It turned from Sveinn, swinging the back of its great paw. The blow impacted on his shield and it shattered. Pieces of oak flew past Geirr’s head. He staggered at the power, but stabbed instinctively at the wolf-bear’s belly. His blade sank deep, and Geirr yanked it out with a twist. But the wound simply enraged the beast. It smashed its clenched paw straight down at Geirr, who managed to escape most of the blow. It still hit his shoulder, and knocked him down. The creature roared and stepped forward. An arrow sliced into the light to hit it in the chest. Another followed a breath later. The impact of Thyri’s arrows caused the creature to step back and give Geirr time to rise again. Sveinn, meanwhile, had been knocked aside as well, but the tough huscarl bounced up with a lunge that went full into the beast’s chest. The wolf-bear shouted his anger and flung itself around. Sveinn had tried to hold onto his sword, but the creature’s twist sent him flying. Geirr heard a thud in the darkness as Sveinn landed. Geirr stepped in with a quick slash at the creature’s knee. He did not follow through on the blow, as he had done earlier, but he did nick the wolf-bear and bounded out of the return swing. He stepped forward and nicked the other leg. It seemed like the beast barely felt the wounds, but once again Geirr was able to step backward and avoid the creature’s swipe. Three arrows in quick succession flew over his shoulder to impact in the wolf-bear that had tossed Sveinn away. Two sank next to Sveinn’s huge sword. One went deep into the creature’s roaring mouth. The creature stumbled off as it tried to catch its breath with an arrow in its throat. Geirr jumped in again, just as he had done before, but this time instead of aiming a quick swipe at the creature’s legs, he swung at the arm descending upon him. The impact knocked Geirr to the ground. He heard the sundering of his family’s water-patterned sword and saw the tip shine in Jussi’s light as it flew away. The blow had hurt the creature though. Its arm dangled, barely attached at the elbow. It tried to pound Geirr with it and looked confused as it did not react properly. Geirr pulled out his short knife, though he had no idea what he would do with it against that thing. It stepped forward to swing its other paw. Geirr braced for the impact. An arrow whistled past his head to join the earlier pair. The creature hesitated, but only for a second, and again Geirr braced as the paw descended upon him. But the paw suddenly curved up as the beast bent backwards. Sveinn had staggered back and he was calmly twisting his own knife deep into the back of the creature’s knee. He was covered in blood. A nasty knock on his head slid down his hair and his cheek, giving color once again to the beard that had long since started towards gray. The creature’s blood gushed over his arm as he twisted the knife. The creature turned towards Sveinn, ripping the blade out of his hand and raking his claws along his hauberk. The iron ripped, and blood seeped through the mail. Sveinn fell back. But Geirr finally saw what to do with his short blade. He jumped on the creature’s back and jammed it into its neck. It rose in a roar, throwing Geirr off to the side. He looked up with blurry eyes as three more arrows streaked in, but it was Geirr’s knife that did the trick, and the wolf-bear, clutching its throat, toppled over, landing on Sveinn’s legs. “No you’re not,” spat Jussi. Dubiously, Jussi helped Geirr stagger to his feet. “No, he’s not. I am, and I tell you to go look at him,” snarled the Jarl of Skjaerdalen. Geirr started towards Sveinn, but would have fallen if Thyri had not come up and caught him. Jussi had set the stone next to the huscarl and was fussing over him. Sveinn watched with his normal relaxed expression as Geirr tottered up to them. It took Thyri gathering a largish stone and a fallen oak branch, plus garnering Ansgar’s help, to allow them to lever the creature off Sveinn. His foot was twisted, the ankle obviously broken. Geirr nodded and followed quickly as he could. The others trudged, carefully, up to the campsite. Sveinn said nothing, but the pain of each step forced gasps out of his throat. She rapped the stone sharply on another rock, and then slid into the tinder and kindling that had earlier resisted all her previous attempts to light. Soon a fire blazed, hotter than normal, with steam rising off the wood. By that point, Jussi leaned back, coughing. Thyri caught him before he fell into the fire. He ignored him, and with fumbling hands, splinted Sveinn’s ankle. Jussi crawled to his bedroll. “He’ll need water. I’ll need food… when I wake.” Almost immediately, he fell asleep. “Not my best, lord.” Sveinn said drowsily. The jarl held up a waterskin, and Sveinn drank. Then, pushing it away, the huscarl nodded off. “Neither have I.” Thyri hesitated. Geirr tried to stay alert, but he too soon nodded off. Geirr shook his head as Thyri laid Sveinn’s sword next to him, the pommel close to his hand. As I’m getting closer to having Where Now the Rider, I thought I’d release some of it into the wild. I also think it might be interesting to you if I annotated some of my thoughts as to why I made some of the choices I did. This first snippet is the start of Chapter 1. I’ll add annotations indented and in italics. Many of you will remember that The Eyes of a Doll ended on 30 Heamoanne. This is the very next day. I could, obviously, have chosen a different day to start, but I think this scene is important for Edward, as you’ll see. Unfortunately, that provided me with a challenge. Edward is wounded at the end of The Eyes of a Doll and he cannot have healed fully in a day. That meant that whatever his next adventure would be it required him to be capable of handling while not fully healthy, at least at the start. I actually have 10-15k of the next novel written because what I started with required him to be fully healthy at the beginning. Where Now the Rider became a completely different story because of this challenge. I gripped the hilt of my saex tightly, tensing to draw it and let blood run along the water pattern in the steel. I originally chose to design Edward’s homeland after the Heptarchy, the time in Anglo-Saxon history when they had seven different kingdoms. After I switched it to plain English and called it the Seven Kingdoms, I was pleased to find the epithet “Sevener” come so easy to the tongue. The rage that filled me blocked the words so that I barely heard the familiar voice. Rage at my lover, who had betrayed me. Rage at my friends, who had betrayed themselves. Rage at the emperor for corrupting them. And rage at myself, for—, well for reasons I could not fathom, but rage nonetheless. This time the voice penetrated enough that most of the rage slipped away, leaving pain in its place. Pain on my left where a blade had nicked my kidney but a few days ago. Pain in my shoulder when a different blade had slid past the bone and through the meat. Without magic, I would be dead, but magic could only do so much. I almost welcomed the pain, given my rage, but even then I knew how stupid it was. I slowly released the hilt and moved my good hand to rest on the parapet in front of me. Without my right arm twisted around my back, my left shoulder and side relaxed and much of the pain went away. “I had to send her away. Gibroz will kill her if he can.” I looked over the wall above South Gate in Achrida. The wall’s crenellations hid the face that had been speaking to me. It mattered little, though, because I knew the sardonic smile that Hecatontarch Piriska Mrnjavcevic wore right then. Gibroz, by the way, is one of the few names that I did not pull from a list of real names. It’s completely made up, though it is based on something in particular. One of my inside jokes, actually, that I will encourage my readers to figure out. Rakija, like all of the food and drink in my novels, is real. As a foodie, one of the fun parts of writing is scouring through traditional dishes to add, for lack of a better word, flavor to my novels. I actually intend to put recipes for things like ajvar and zelniks on my wiki entry for those things one of these days. Off in the distance, I could still see two tiny black shapes kicking up dust in the dry summer morning. Then they turned past a hill and I would never see my lover again. I had no need to watch the caravaners jockeying for position or listen to their vicious cursing at each other, so I straightened up. The wound on my side protested again. I desperately wanted to scratch it, but fortunately the sling holding my left arm prevented me from scratching it. As I said, I think this scene is important for Edward. He has to physically watch Gabrijela leave. I may be wrong, but I also think it’s important for my readers to see her leave. One of the reasons I think that’s true is that Gabrijela is not out of the overall story of Shijuren and the Empire of Makhaira. She’s too interesting of a character to simply let her go. What her adventures will be is yet to come, however. I liked my spelling better so I kept it, even if I’m wrong. Gabrijela had seen me standing on the gate as she passed through, but she had done nothing. I would not have known what to say if she had. I had sent her away because I loved her, but I could never trust her again. Nor could I trust the Emperor that had ruined her life simply to serve his madness. Now I saw the sardonic smile as Piri turned to me. “I didn’t say it was the wrong choice, only that you’re a fool.” She had earned that smile on dozens of battlefields and in years of training new warriors. Piri said nothing as she led me down from the battlement. My bencriht thegn, Maja Mrnjavcevic, waited for us, restless as always. She started to say something, but Piri quelled her with a sharp look and led us back up the Trade Road. Maja is an interesting character to me. I really like her potential for growth and someday she might be an even bigger character in Shijuren than Edward, assuming I don’t kill her off. I don’t plan to, but I might change my mind. And accidents happen. I’ve already killed a character in I Am a Wondrous Thing that I didn’t mean or want to. However, circumstances dictated it. I followed the hecatontarch in silent thought until she turned off from the road. Given that we had miles to walk before getting to the Square of Legends, I glanced at her. I just want to make it clear that Karah is *not* modeled on any server that I know. Certainly not the ones at Brewbaker’s that routinely take care of me even though I sit here for hours working whenever I can. The thought of antagonizing the perpetually grumpy Karah, daughter of Ragnar Longtongue and barmaid of his inn, broke the mood. Overall, I tried to make this opening portion contain a goodly amount of summing up from what happened in The Eyes of a Doll without being pure exposition, while also setting Edward up as somewhat adrift. Part of the challenge writing Edward is that, for my purposes, he needs to stay in Achrida so I can continue to write these novels, but all along I’ve been working to make him have a reason to stay. In the most simplistic form, A Lake Most Deep trapped him in Achrida for a moment, The Eyes of a Doll cut off his original plans, leaving him adrift, and Where Now the Rider will give him an actual reason to stay. The rest of Chapter 1, by the way, is the meeting with Vukasin and some hints of what’s to come in this story. I’ll leave that portion for later.